Learn all about CSS in our free CSS tutorial section. Our tutorials cover basics of CSS as well as advanced techniques, tips & tricks. All our tutorials include the code, download files and detailed explanations of CSS. Learn all about css borders, backgrounds, shadows and create interesting galleries, preloaders, buttons, boxes, forms, websites and drop down menus with our CSS tutorials. Also, add some cool effects using jQuery! New! Responsive Website Design Tutorial! This tutorial is will teach you the basics of responsive design and how to create a simple responsive website. Learn how to create an awesome single page website design with multilayered parallax scrolling animation using css and jquery. In this tutorial you will learn how to create animated clouds in the backgrond, a moving hot air balloon in the foreground and animated links & titles. In this tutorial you will learn how to create a parallax scrolling effect using CSS & jQuery. This is a growing trend now in website design with many single page websites using this technique to create interesting and interactive websites. Learn how to create an animated preloader using CSS & jQuery. Learn how to create buttons with sliding menus using CSS & jQuery. Learn how to create a tabbed content box using CSS and jQuery. Create a beautiful form with pop up message boxes using CSS & jQuery. Here are some useful tips on how to use CSS with IE. Learn how to create a simple gallery with a lightbox effect in CSS & jQuery. Create a collage photo gallery with CSS & JQquery. Basic concepts, tips, tricks & design ideas. Learn how to use any font of your choice in your web page. Create a drop down menu using CSS styles. Amazing shadow effects in CSS! 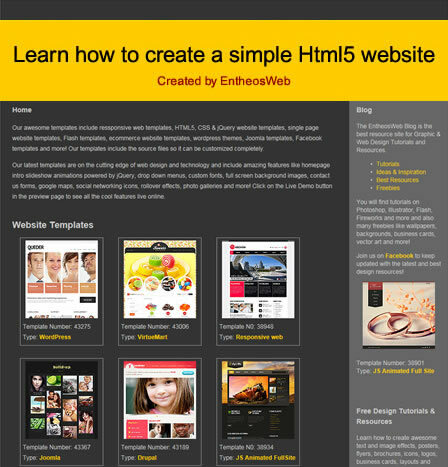 Create a website using HTML and CSS Styles. Syntax, tips, design Ideas & sample code. Create a CSS thumbnail gallery with fancy border styles. Create some awesome shadow effects in CSS! Use CSS Styles to give stylish effects to text.